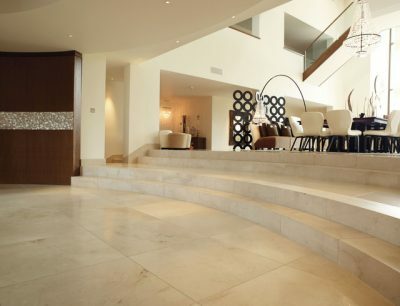 Many may not be aware of this, but Crema Marfil is one of the most popular marble tile products in demand. Marble is considered the go-to material when it comes to upgrading kitchens and bathrooms. It is a regal feature that can increase a building project’s expenses, but also it’s profitability, which makes it a product that is high in demand. Crema Marfil is widely chosen for it’s neutral coloring and timeless look. This particular type of marble can complement almost any décor and easily pair with darker tones. It can be seen in the business districts inside modern buildings generally installed in the foyer area as flooring and even as a wall décor. Crema Marfil originates in Spain. It is considered the most famous natural Spanish stone. The main quarries for this stone can be found in the area of Mount Coto and Mount Zafra. Because of its popularity around the world, Crema Marfil is usually exported. This explains why the stone is sold at a premium price. Due to its popularity, more quarries primarily located around the town of Pinoso in Spain have sprung up to meet the demands of the market. Another reason why Crema Marfil is in such high demand is not only because of its appearance, but also because of the availability and versatility. Crema Marfil can be used for a number of different applications making it the most sought after building material for builders and contractors around the world. Marble is a natural stone, which means that the way it was created was naturally processed. The way marble is processed is through immense heat and compression deep within the earth’s crust over a period of years. Marble, being primarily a source of limestone, melts along with other minerals and fossils. Once it cools, the minerals recrystallize into a new kind of rock that we know as marble. This metamorphic transformation is conducted all over the world. Depending on what kind of rocks and other minerals melt together will determine the type marble bedrock that will be formed. In the region of Pinoso, Crema Marfil is indeed present, but depending on where it is mined, there will be different variations of this mineral. This is the most expensive grade of marble. There aren’t as many fossil sediments created in this particular grade resulting in little to no veining, producing an overall color of uniformity without hardly any strong chromatic variations. This grade of Crema Marfil is not as easily available to the market because it’s typically harder to supply. So to see this grade anywhere is considered most impressive. Crema Marfil Standard is considered top quality and what developers and contractors choose for the highest standard attainable for their building projects. It has a little more color veining creating a more yellowish beige hue, still neutral enough to be incorporated into any style of design though. The commercial version of Crema Marfil represents the mainstream demand for this grade. Like the first and the standard, the commercial has a uniform background color, but the veining is far more noticeable. The background color can range from an ivory to brown-beige hue. The Crema Marfil Classic is going to be the cheaper grade below the commercial. This class is still sold at a competitive price, but the selection is not as good because the veining is more noticeable, being darker and visibly dispersed throughout the slab. Just because it’s titled ‘basic’ doesn’t mean that the grade is cheap, although it is the less expensive grade. Considered by some to be the scraps of the pick, its still marble!Yet, because this grade is like the residue of the Crema Marfil First, one shouldn’t expect to seek out a catalog of selections. With this grade, what you see is what you get. Polished – The surface of Crema Marfil buffed into a luminous reflective finish. This is the most popular type of finish that is typically used on floors. Honed – For those who are not too fond of the shiny reflective finish, the option to go with a honed type of finish will still provide a regal matte-looking finish. Bush Hammered – For a more elegant, yet rustic looking feel, consider the bush hammered finish. This kind presents a textured surface that is mostly used for outside flooring. Brushed – The brushed finish is a cross between the hone and bush hammered resulting in a softer looking décor with a brushed type of texture. With all of these options, the best way to manage your business is to stock your marble in bulk. By keeping a sufficient supply of Crema Marfil Marble with different types of finishings in your store or warehouse, you will be able to present a diverse catalog of quality marble slabs to your customers and be able to fulfill their orders at a moment’s notice without having to wait for a third-party distributor. Also, buying your Crema Marfil at a wholesale price can save your business money, because for most wholesale distributors, the more you buy from them, the less the unit cost might be. So if you are curious about Nalboor‘s selection of marble tile, take a look at our online catalog here. We provide free samples so that you can take confidence in knowing exactly what kind of Crema Marfil marble you are going to get. Pick up the phone and call us today at 1-305-501-4548 or contact us online with any questions you may have right now!